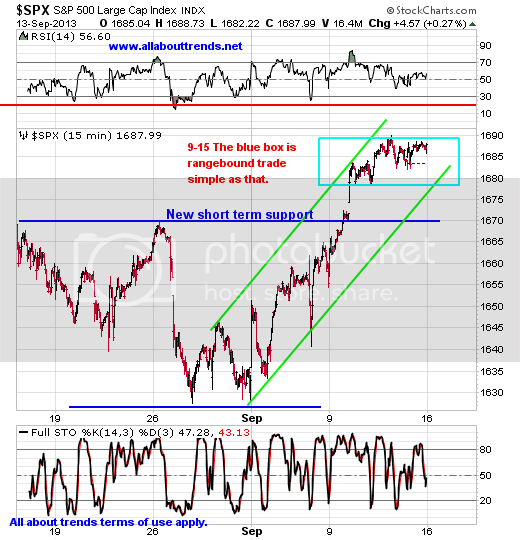 Indexes Poised For Another Leg Up? As we go into next week technically speaking we are consolidating at the highs in a clearly defined uptrend channel. 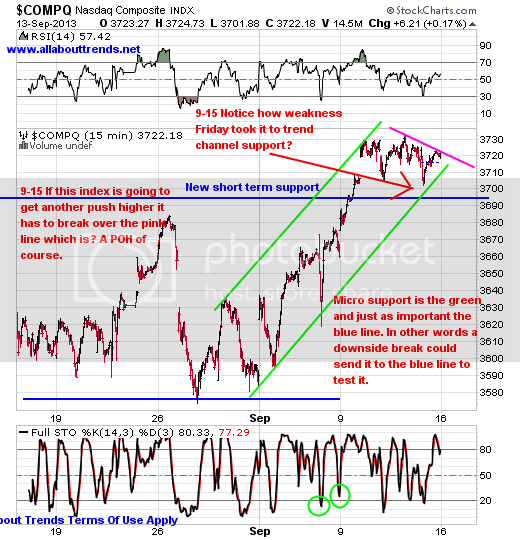 Keep in mind we can break the green trend channel to the downside and tag the blue support and still be ok. The same goes for the NASDAQ below. Technically this makes us wonder if the market has already built in because everyone has been talking about it for weeks now so no surprise there. A small taper or better still no taper? Think about that for a moment no taper? That would be a surprise now wouldn’t it? Think the market would react positively or negatively to that when everyone is expecting some sort of taper ? The flip side is? Big taper? You think the Fed doesn’t know the repercussions of that in the market Heck they know, think back to what the initial reaction was when all they did was mention it. Just something to think about for those who of you that like to think a lot vs. trade what you see. As we go into next week technically speaking we are consolidating at the highs in a clearly defined uptrend channel. That’s bullish and that’s the reality at this point in time. Until that changes? And it will sometime we assure you we won’t fight the tape but we won’t be blind to what could transpire to the downside either you know. A downside break of the blue short term support lines above would be a cause for concern but as always we’ll take it a step at a time, a day at a time and let the markets and stocks tell us what to do by the action they exhibit vs. what we think hear or fear. We have a great month going here and month to date are currently looking at gains of $5,193.25 with our overall portfolio at all time highs. And we still have 2 weeks till the end of the month to go. 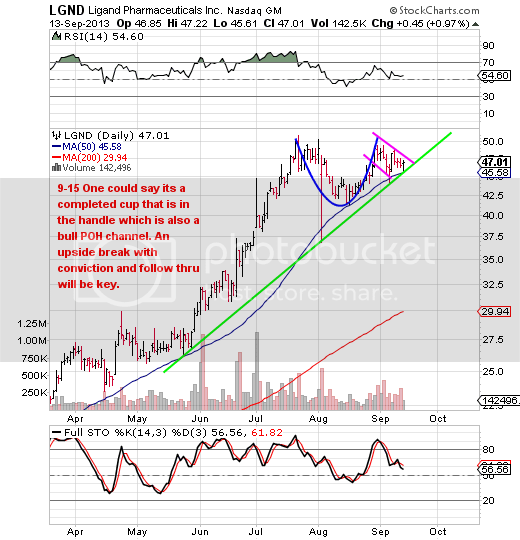 We’ll take it a stock at a time here and pick them off selectively so keep an eye on LGND (new name) as it’s a top priority name sporting a cup and handle pattern as shown below.